Try adding this delicious healthy recipe in your meal plan. It's easy to cook and delicious to eat. It's a easy yummy healthy recipe. 1. Preheat your oven to 400 F.
2. 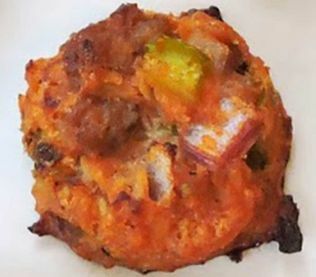 Press one slice of salami or pepperoni into each muffin cup. 3. Fill each pepperoni cup with sweet peppers and tomatoes. 4. Add about 1 tsp. of sauce to each cup. 5. Add the almond cheese on top of the sauce, and sprinkle some fresh basil on top of each mini pizza. 6. Place in the preheated oven and bake for 7 to 10 minutes or until salami is crisp. 7. Remove from the oven and serve hot.